My daughter is gone. She's a couple thousand miles away and I miss her. It is amazing how quiet a house becomes when it goes from 4 down to 3. She's a pretty quiet girl anyway for the most part, but I really miss her presence. It's spooky quiet most of the time, even with Ben and his friends over. It's like the house is missing it's furnace or something. Something major like that. There are moments you forget it's there, but without it, the house just isn't complete. She is in the Dominican Republic in Jarabacoa on a mission trip for church. She wanted to go of her own accord, and we weren't about to stop that. Anytime one of our kids wants to do a church event, especially of this magnitude, we aren't going to do anything but get behind it fully and completely. I think it's important for her to see what real poverty and need is like, even though I think she has a much better understanding of it than most 15 year old girls, and I'm not just saying that because she's my daughter. She has a zeal for seeing the world and a big heart to go with it. She thinks internationally whereas when I was a kid, I could barely think anymore than regionally. It's a different time now than it was in 1976 when I was 15. The Internet has made the world a much smaller place. And so I wonder what she's doing at this very moment. Is she hanging out after dinner with the team, talking about their day? Is she mingling with the locals in some sort of social event? Journaling? Worship? Prayer? Because they are in the remote mountains of Jarabacoa, they have very little outside access. We got an e-mail today from the lead pastor who said they had arrived safely and were facing a long week of laying block for the orphanage they're working on. The leader told us to expect her to be tired from all the work. I was thinking about her yesterday and how she'll do and it occurred to me that she'll be fine. She is an A+ student, and works hard at everything she does. She's a perfectionist and doesn't want to let anyone down when it comes to team projects. She'll work to get as much done as she can before she returns. It's just the way she's wired. She's a worker bee. There's times she wants to be the queen bee, but she's a worker bee at a minimum. I miss her greatly, but know she'll come back a changed person. Speaking of worker bee, I spent 3 hours Saturday on a church service day event. Elmbrook hosts these events 4 times a year where we go into the community and volunteer. This one had some of us going to West High School. We were charged with cleaning lockers and desks. 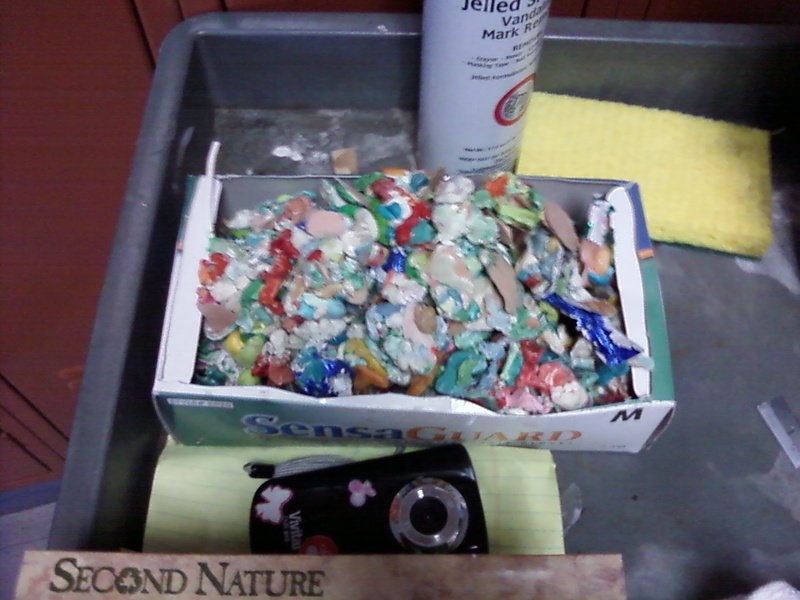 The desk cleaning meant scouring the tops with soapy water, but also scraping gum off the undersides of the desks. To say it was disgusting is an understatement. The picture you see above is the sum of all of our work, and we only covered 4 classrooms worth. We were joking how the gooey stuff was from the last week of school. We wondered what to sculpt with the finished product, but decided to let it speak for itself as a single mountainous mass. We also joked that we'd have to do a blindfolded taste test to anyone who didn't pull their weight. In any case it was a great day of service. The kids worked hard, especially when we moved from something boring like locker cleaning, to something gross they could relate to like chipping gum off desks. Gotta love that kid spirit. The http://mrmomforaweek.blogspot.com link should redirect you to the new one, but I just wanted to make you aware of it. Thanks again for checking out and/or following my blog. It's a fun way for me to keep my writing fresh and to keep brushed up on my skills.